In addition to supporting missionaries of the Southern Baptist International Mission Board, we also believe it is the commission of every Christian to go and tell the good news of Jesus Christ. We are currently participating in two partnerships. We are in the middle of a multi-year partnership with Hope Rising Children’s Ministry in Leogone, Haiti. Our church is blessed to have several church members who have served either as foreign missionaries or in other language situations. We do not believe that God brought us together by accident. Our church family has been blessed with several Chinese language speakers. 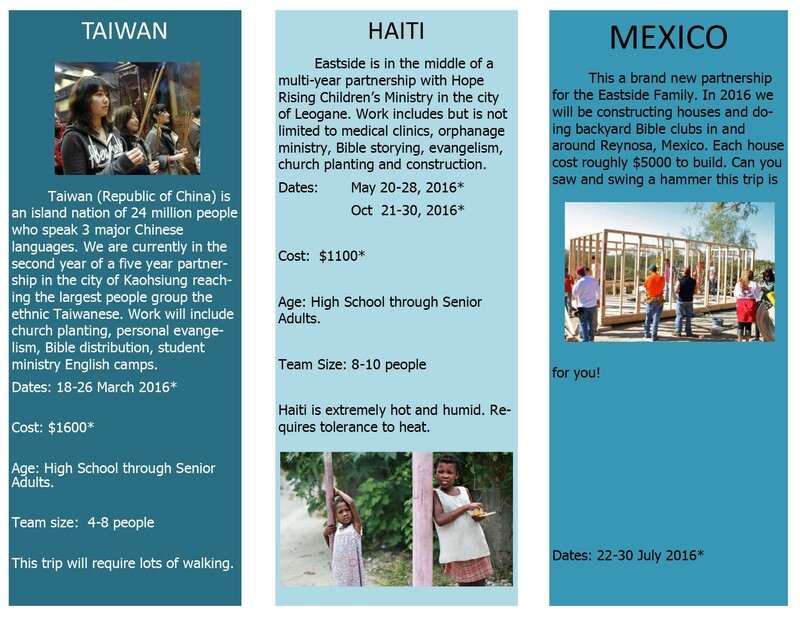 We are currently in the second year of a five year partnership in the city of Kaohsiung reaching the largest people group, the ethnic Taiwanese. The ethnic Taiwanese make up nearly 80% of the population but are less than 1% Christian.